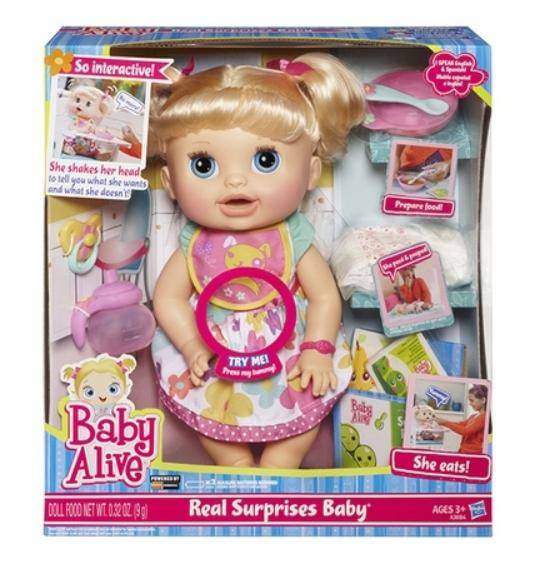 Baby Alive Real Surprises Doll $32.99 Shipped! Home / Deals / Black Friday Deals 2018 / HOT! Baby Alive Real Surprises Doll $32.99 Shipped! HOT! Baby Alive Real Surprises Doll $32.99 Shipped! HURRY and get a Better Than Black Friday price on the Baby Alive Real Surprises Doll! It is marked down to only $37.99 and you can get $5 off with the coupon code 5OFF15 at checkout! This will also ship for FREE so after the coupon code you will get this Baby Alive Real Surprises Doll for only $32.99 Shipped! On Black Friday, the best deals will be around $45, so HURRY and get this one for LESS right now! These are going to sell out fast! Black Friday DVD Deals priced Under $5 Each!